Sadly this isn't a post about the awkwardness of meeting a girl's parents. That's a scenario i'm yet to experience. Instead it's a post about something i know arguably a little too well. Right now this and Spooks are the only shows I almost compulsively HAVE to watch as soon as a new episode is shown, and Spooks cheats by ending every episode with a ridiculous cliff hanger which means I lose any element of conscious choice. HIMYM (not a huge fan of abbreviations but in this case it will save time) on the other hand rarely uses cliff hangers, unless you count the legendary carry over between seasons 2 and 3. Despite that, without fail as soon as a new episode is shown i find a way to watch it. 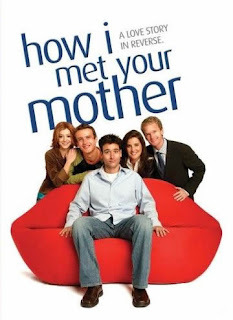 For anybody who hasn't seen it yet, and i'd advise you give it a try if you haven't, HIMYM hinges on architect Ted Moseby recounting, in detail, how he met the mother of his two children to those same, increasingly exasperated children. In reality it is merely a plot device to see Ted and his group of friends' experiences as they become fully fledged adults, with all the relationships, uncertainty and pressures that come with it. I love the show. I love the characters. I love the plots. I love the one liners (especially the lines Barney, played brilliantly by Neil Patrick Harris, delivers). It has been pointed out to me, and it hadn't completely escaped my notice previously, that i have some things in common with the central character Ted. I guess that plays a pretty major role in my affection for the show, he's a central character who I find it all too easy to relate to; the hopes, neuroses and confusion are all very familiar. There's also the fact that we share an attitude that we'd be quite happy if the next girl we met was 'the one' rather than feeling any real need to play the field or whatever other cliché you want to use. I was given series one and two on DVD for my 20th birthday and there's two episodes in that first season which are the reason i initially fell in love with the show. First is an episode called "The Pineapple Incident" focussing on what happens when Barney get's Ted drunk to stop him over-thinking. The results are in places hysterically funny but it was the jokes about how Ted needed to stop thinking and just act that made me relate to him; anyone who knows me will know that there are times where I really could do with thinking a little less. The second episode is the series one finale and as I don't want to give the plot away i won't say too much, but the combination of a big, stupid romantic moment and a heart breaking moment in the final 5 minutes, to a soundtrack of 'This Modern Love' by Bloc Party was pretty much guaranteed to make me a fan. I have mixed feelings about actually meeting the mother. On the one hand I have no real desire to see the show end, while I still await each new episode with genuine anticipation there's a part of me that just wants it to go on and on. Also I can't help but fear that the mother will turn out to be a bit of an anti climax. After all the women and stories that have preceded her during the show's run she's going to have to be something pretty special to justify the wait and for it to truly work as a conclusion. The second half of season 5 and the first few episodes of season 6 have given the audience a few more clues to the mother's identity and we've met her flatmate (Rachel Bilson, who I kind of wish could have been the mother) so it seems the end may not be too far away though they've still not committed themselves to any kind of time frame for revealing her. The other side though is that many shows go on for too many seasons and end up spoiling their own legacy rather than going out on a high. So far the consistency of the show (now over 100 episodes in) has been really good and it would be a real shame if they dragged the concept out to the point where the quality threshold started to slip. Also I am excited to find out who the mother is and I have pretty high hopes that it will be a suitably epic romance between her and Ted, the kind which I am a complete sucker for. So i guess that leaves me anticipating the end but in no rush to get there.